I've been planning this car for about ten years and have made a few starts at it, but always with cars that were basket cases and needed tons of work to even get a solid starting point. That has recently changed with the purchase of a complete, running and rust free '49 from Kansas. Before I get to into it, though, I am thinning the herd and selling off the wagons to make room in the shop to work on this one. Over the years I have collected most of the cool, hard to find parts like the '52 Chevy grille with extra teeth, '50 Oldsmobile one piece windshield, '60 Olds steering wheel and column, '50 Pontiac side trim, '49 Buick tail lights and '56 Olds fender caps for the headlights. On standby is a freshly machined '54 Desoto Hemi to use with the new Mooneyes six carb fuel injection. The interior will be white tuck and roll with black piping on the original seats and door patern and black carpets with white piping. Now, all I need is some shop time! 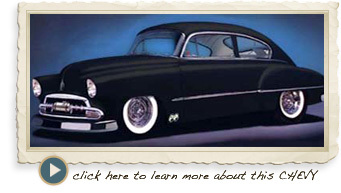 Click here to learn more about this Chevy. 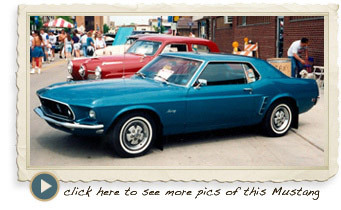 My dad bought this 1969 Mustang in 1983 as a replacement for his white, rusting 1970 Mustang. We cleaned it up and he showed it for several years. Unfortunately, we were later to discover that the shiny new paint had been improperly done and did not last real well. Needed a car when my convertible was wrecked, dad loaned me his Mustang and over the years, it just seems to never had made it back to his house. :) So, now, I guess it is mine. I have taken a few liberties with mag wheels and adding the Mach 1 hoodscoop and blacked out hood to cover some of the failing paint. My plan is to completely disassemble it soon and have it completely repainted and put back into a show worthy car. Click here to more pics of this Mustang. But of all of these, my favorite is my first car, which I still own. Dad got me this 1964 Pontiac convertible when I finished high school. A rust free California car, I am the third owner. The car was completely stock when we got it, but had been painted several times and the interior had had about all it could take. 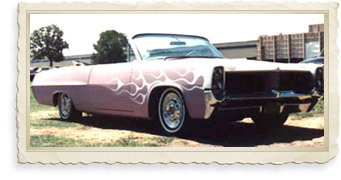 During college, I stripped it to bare metal and began a white tuck and roll interior using '65 Thunderbird seats and center console. Once I began dental school, I had no time to continue working on it, so it was just transportation and never finished. Sadly, the week I moved to Conway, the car was rear ended and damaged pretty severely. I have collected rust free parts from Arizona to rebuild it, but with so many other projects, it waits until I can concentrate on doing the job right. In the mean time, it still gets driven on sunny days just for fun, even though the rear end is pretty bent.